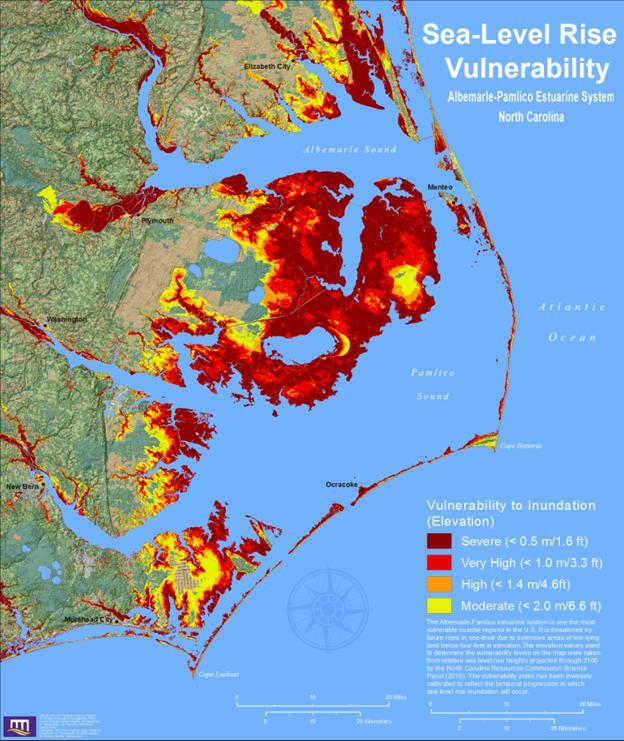 A map shows how various levels of sea-level rise would impact eastern NC. In 2010, the Science Panel that advises the North Carolina Coastal Resources Commission released a report. It said the state could expect a 39-inch sea-level rise by the end of the century. If that came to pass, it would affect billions of dollars of property along the coast. It was a report that shocked and galvanized a community of public officials, county managers, and business leaders. They quickly formed NC-20, a group that lobbied the Legislature to discount the report. It worked. In 2012, the Legislature passed a four-year moratorium on new policy related to sea-level rise. And the Science Panel was directed to work on a new report – one that would look just 30 years out. For the Colbert Report, it was almost too easy. A fastball right down the middle of the plate. That line quickly morphed into “North Carolina has outlawed sea-level rise,” and reverberated across the internet. Environmentalists used it as a call to action. Others didn’t think it was so funny. “Well, if you have to have Stephen Colbert validate your science, would that not also be a travesty?” says Larry Baldwin, who works in coastal development and lives in Carteret County. Baldwin is the vice-president of NC-20 – the group that formed after the first sea-level rise report and successfully lobbied the Legislature. Baldwin is now also a member of the State’s Coastal Resources Commission – the appointed body that establishes policies for issues relating to the coast. And it’s a group that has changed drastically - two-thirds of the CRC Commissioners are new, appointed by the state’s Republican leadership within the last year. Baldwin says he hopes this latest Science Panel report is more comprehensive. “What I expect from them is for them to look at all the science that is out there to where we can look at both sides of the issue and not just look at one side of the issue,” he says. To help reach his goal, Baldwin nominated some new members for the Science Panel. His choices were people who serve as science advisors to the NC-20 advocacy group. They do not have a background in coastal geology or engineering, as the other members of the Science Panel do, and downplay the threat of sea-level rise. Despite openings on the Panel and a favorable political situation, they were not appointed. Frank Gorham, the chair of the Coastal Resources Commission, made that decision. Gorham was appointed to chair the CRC by Governor Pat McCrory last year. He’s a resident of Figure Eight Island and works in the oil and gas industry. This Science Panel is charged with looking at sea-level rise just over the next 30 years. That's a controversial mandate, as the large majority of experts believe sea levels will rise much more dramatically in the latter half of the century. Eight men and two women currently make up the Science Panel. Their latest meeting took place in a room off a kitchen, in a cooperative extension agriculture building in New Bern. They spent five hours sitting in plastic chairs around card tables, analyzing maps and tide gauge charts projected onto a screen. All of the data show a gradual rise in sea level - greater in some places, less in others, measured in millimeters. “The idea of the Science Panel is let’s bring the best science we have together and help eastern North Carolina and Eastern North Carolina’s economy,” says Stan Riggs, a coastal geologist at East Carolina University and a member of the Science Panel. He’s been on it since its inception in 1996. In his 40-plus years in the area, he’s seen remarkable change on the coast, and he’s about done with all these government panels and delays. 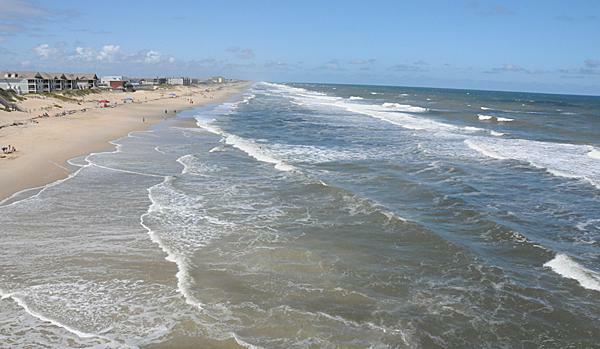 The beach in Nags Head was re-nourished in 2011 because sea levels were threatening numerous properties. This Science Panel is charged with looking at sea-level rise just over the next 30 years. That’s a controversial mandate, as the large majority of experts believe sea levels will rise much more dramatically in the latter half of the century – the so-called hockey stick effect, because of how that rise looks on a graph. Scientists believe that rapid late-century acceleration will happen due to a warming climate and its effect on expanding oceans. The first draft of the new sea-level rise report is due in December. After peer review, it will go to the Coastal Resources Commission and, in 2016, to the Legislature. And then, maybe the late-night comedians will have another crack at it. >>Look at the original 2010 report. The CRC's Science Panel has until the end of the year to submit a new sea-level rise report. A new report from NationalGeographic.com begins this way: "Development and climate change are causing the islands to slowly vanish, scientists say."